Searching is a hyper-modern thriller told via the technology devices we use every day to communicate. In it, David must trace his daughter’s digital footprints before she disappears forever. After David Kim's (John Cho) 16-year-old daughter goes missing, a local investigation is opened and a detective is assigned to the case. But 37 hours later and without a single lead, David decides to search the one place no one has looked yet, where all secrets are kept today: his daughter’s laptop. If you like this kind of movie, also be sure to check out Nacho Vigalondo's Open Windows. In the summer of 1948, Dr. Faraday travels to attend to a patient at Hundreds Hall, home to the Ayers family for more than two centuries. The Hall is now in decline and its inhabitants are haunted by something more ominous than a dying way of life. When he takes on his new patient, Faraday has no idea how closely, and how disturbingly, the family's story is about to become entwined with his own. 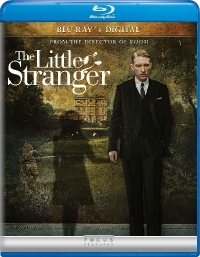 The Little Stranger stars Domhnall Gleeson (Ex Machina, Brooklyn) and is directed by Oscar-nominated director Lenny Abrahamson (Room). In Critters, the terrified Brown family are trapped in a deadly nightmare and must fight for their lives against a litter of extraterrestrial, bloodthirsty monsters. But it’s a losing battle until two intergalactic bounty hunters arrive, determined to blow the creatures off the planet! In Critters 2: The Main Course, some eggs have survived and are popping open, bringing another horde of the little creatures! 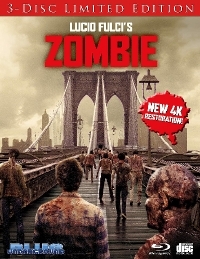 Brad Brown (Scott Grimes) returns to fight them along with three bounty hunters. Critters 3 stars Leonardo DiCaprio as Josh, a beleaguered Angelino who must lead the fight against the little monsters as they invade an L.A. apartment building. 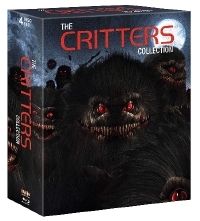 In the final film, Critters 4, a super strain of genetically engineered monsters are designed to take over the universe. This time, Brad Dourif and Angela Bassett must battle the little bloodthirsty hairballs. Beginning in Buffalo, New York, during the 1880s, Crimson Peak stars Mia Wasikowska (Alice in Wonderland, Stoker) as Edith Cushing, an aspiring writer who is haunted by the death of her mother. Edith s falls in love with seductive stranger Thomas Sharpe (Tom Hiddleston, Avengers Assemble), who whisks her off to Allerdale Hall, his baronial, yet dilapidated English mansion built upon a mountain of blood-red clay. Here Edith meets Lucille (Jessica Chastain, Zero Dark Thirty), Thomas s sister who at times seems hostile and jealous. 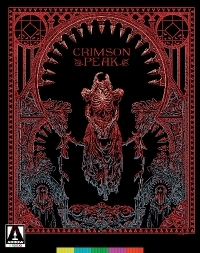 As Edith struggles to feel at home in the imposing residence, she gradually uncovers a horrendous family secret and encounters supernatural forces that will help her discover the terrible truth behind Crimson Peak. Boasting incredibly intricate and ornate production design and a rich visual style, del Toro s film is a grandiose, boldly baroque triumph of Gothic decadence, which expertly combines and contrasts the sublimely beautiful with the shockingly grotesque.Crimson Peak is presented here in sumptuous special packaging, with a wealth of extra features, affording unprecedented insight in to the making of this modern Gothic classic. 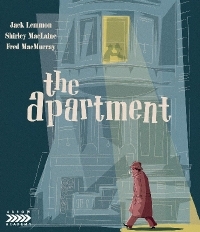 Winner of five Academy Awards, including Best Picture, The Apartment features a wealth of Hollywood's finest talent on both sides of the camera at the top of their game. By turns cynical, heart-warming and hilarious, Wilder's masterpiece now shines like never before in this all-new, 4K-restored edition from Arrow Films.